Toddlers burst upon the scene with great gusto determined to assert their autonomy and individuality. Many of the skills they acquire during this stage include talking, problem solving, relating to others and toilet training. Toddlers like to do things for themselves, and use “no” many times each day. They have boundless energy, with an innate need to explore their environment and are now beginning to define themselves as individuals. They want to be independent and yet they are still very dependent. They sometimes get frustrated because they do not have the language skills to express themselves. Caregivers understand the toddler’s need to explore and assert him/her self by providing a safe, well-prepared environment. 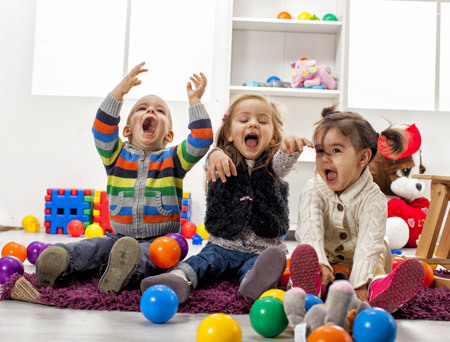 Our Toddler room is a cozy space with interest centres set aside for quiet and active play. A variety of natural, sensory and learning materials which stimulate the child’s curiosity are stored in low shelves and children are encouraged to investigate them. Interest centres are developed around sand and water tables, an art easel with lots of colourful paint, a dress up corner for pretend play, blocks to build with and a story corner with soft cushions and great books to explore. Our playground is a safe outdoor space where your child can actively explore and practice his/her motor skills. Caregivers are always there with open arms and warm hugs to provide love and security, which develop trust and confidence. At this age children begin to show signs of readiness for toilet training. They stay dry for longer periods of time and will sometimes express discomfort about being wet or soiled. When the parent feels the child is physically and emotionally ready, it is important to let the caregiver know so that we can follow through with the child’s progress. Children should never be forced and if they resist training,abandon attempts for several weeks and try again. A child feel most comfortable when he/she knows in advance what is happening and when. Established routines provide consistency and allow a smooth flow of daily activities. Following morning activities, children sit together as a group for lunch, say grace and enjoy a relaxing meal with their friends and caregiver. Lunch is followed by clean-up, bathroom routine and naptime. Diapers are changed and caregivers supervise and assist your child with brushing his/her teeth and washing up. Finally, children find their cots which are prepared with a favourite blanket, pillow and cuddle toy. Soft relaxing music is played and children are comforted as they drift off to sleep. Staff are happy to tell you about your child’s day and a report is completed daily identifying significant events. Photos and stories, which document learning are stored in your child’s binder and are easily accessible to both you and your child.